Toshiba Thrive Tablet: Trading Sleek Design for USB? Say hello to another tablet! With the growing popularity of tablets today, we’re expecting multiple eruptions from consumer electronic leaders to take a shot at this new trend. That is why we weren’t surprised to know that laptop guru Toshiba is coming out with its own piece. But what would it take for Toshiba to stand out from the crowd of tablets? Can it fill in any technology gaps missing from competing devices? The Toshiba Thrive tablet will seem noticeably thicker, and it is, in fact, at 0.6 inches. What’s more is it weighs 1.6 pounds, which is nearly identical to the weight of my first netbook. So is the Thrive really a tablet or what? The screen is just over ten inches and it runs the Android 3.1 operating system. But with the new iPad 2 coming out with such a fine build and magnificent slim physique, the Toshiba Thrive doesn’t seem like it’s designed for the portability that should be inherent in tablets. Do you really want to carry a 1.6-pound, half inch thick tablet around? There is a method behind Toshiba’s madness for this thick Android tablet. It boasts a USB port, USB mini port, HDMI out port and an SD slot, making it extremely functional. Store and transfer your files easily and conveniently from your USB device to your tablet, and vice versa. Adopting USB technology has really given this Honeycomb tablet an edge because it allows for more people (everyone seems to have a USB gadget today!) to have a better way to connect to their tablet. Other features of the Toshiba USB tablet include a 2.1 MP front-facing camera, a 5 MP rear-facing camera, a gyroscope, and Bluetooth. A simple display opens up for the user, then there’s a button to lock the screen orientation. The back is covered with a rubber material for easy grip. Power-wise, it also sounds very promising, as Toshiba claims that the tablet can run up to 8 hours of battery life while continuously playing HD video. You can charge it for 1½ hours and see that it’s already 90% full. Now, one downside: The Toshiba gadget is Wi-Fi only, which defies the portability it should be serving. Why else would you want a tablet to carry around while on the bus, if it cannot connect with your 3G?! To make up for that, Toshiba has included features such as Log Me In software that allows users to access their home PC desktops through the Thrive, and a file manager using Android to browse files stored on any storage device. If all these sound appealing to you, Toshiba has partnered with Best Buy to take advanced orders starting June 13. If you’re still thinking about it, you still have enough time to ponder until it hits the market on July 10. The 8-gig is priced at $429, the 16-gig at $479, and the $32-gig for $579. With the USB port adoption, it’s a thumbs-up for us, how about you? Do you think it’s worth the price? This entry was posted in Articles, Toshiba Thrive Tablet, USB Devices, USB Gadgets, USB Tablet, USB Technology and tagged thick Android tablet, Toshiba gadget, Toshiba launches Thrive tablet, Toshiba tablet PC, Toshiba Thrive Tablet, Toshiba Thrive tablet with Android, Toshiba Thrive tablet with Android 3.1, Toshiba Thrive Tablet with USB port, Toshiba Thrive USB Tablet. Bookmark the permalink. 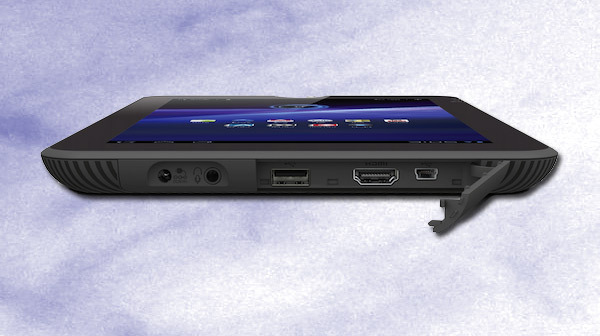 One Response to Toshiba Thrive Tablet: Trading Sleek Design for USB? The Thrive is falling right around where the other tegra 2 tablets are, the Galaxy Tab & iPad 2 are I believe the only devices falling in the 1.25-1.35 weight range. The other devices have that extra .2 to .3 lbs due to building the larger housing to support the extra ports and functionality.